Netherlandish Northern Renaissance Painter, ca.1450-1516, Flemish painter. 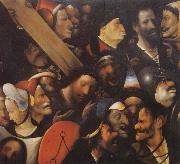 His surname was originally van Aeken; Bosch refers to 's Hertogenbosch, where he was born and worked. Little is known of his life and training, although it is clear that he belonged to a family of painters. His paintings, executed in brilliant colors and with an uncanny mastery of detail, are filled with strangely animated objects, bizarre plants and animals, and monstrous, amusing, or diabolical figures believed to have been suggested by folk legends, allegorical poems, moralizing religious literature, and aspects of late Gothic art. Such works as the Garden of Earthly Delights (Prado) appear to be intricate allegories; their symbolism, however, is obscure and has consistently defied unified interpretation. 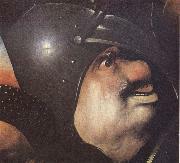 Bosch clearly had an interest in the grotesque, the diabolical, the exuberant, and the macabre. He also may have been the first European painter to depict scenes of everyday life, although often with a strong element of the bizarre. King Philip II of Spain collected some of his finest creations. The Temptation of St. Anthony (Lisbon) and The Last Judgment were recurring themes. Other examples of his art may be seen in the Escorial and in Brussels. Examples of the Adoration of the Magi are in the Metropolitan Museum and in the Philadelphia Museum, which also has the Mocking of Christ. 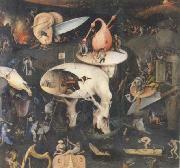 Bosch, who deeply influenced the work of Peter Bruegel the Elder, was hailed in the 20th cent. as a forerunner of the surrealists, and his work continues to influence many contemporary artists.